"This dish is slightly spicy. It has a unique and awesome taste!" Heat 1 tablespoon olive oil in a large skillet over medium heat. Saute chicken until firm and lightly browned; remove from pan. Add the remaining tablespoon of olive oil to the skillet. Cook and stir garlic, asparagus, and red pepper flakes in oil until asparagus is tender. Stir in chicken, and cook for 2 minutes to blend the flavors. Season with salt and pepper. 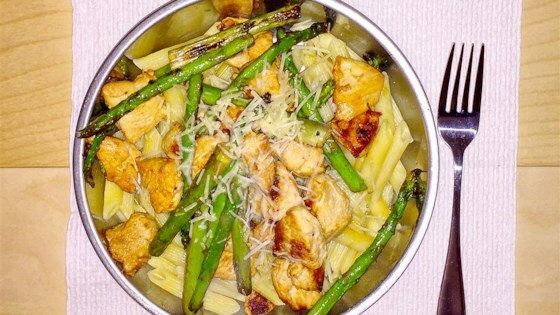 Toss pasta with chicken and asparagus mixture. Sprinkle with Parmesan cheese. Delicious! Easy to make and tasetd great too! This was ok. Needs some color maybe a red bell pepper. Some garlic and onion. I also added a little bit of chicken broth because it was a little dry.